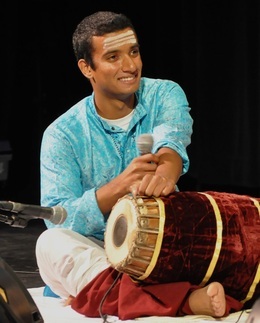 Vignesh Venkataraman, a senior at Stanford University, is a mridangam artist hailing from Umayalpuram Sri. K. Sivaraman’s school of music. Vignesh was initiated into playing mridangam by Sri. Anand Iyer, also from the same school. Over a period of 5 years, Vignesh traveled to India every summer to undergo advanced training under the tutelage of Umayalpuram Sri. K. Sivaraman. Vignesh has accompanied various artists, including some senior musicians, in concerts in the San Francisco Bay Area and in India. He has participated in competitions at the Cleveland Thyagaraja Aradhana and has won several prizes there. He won the Best Mridangist award at the Spirit of Youth festival held by the Madras Music Academy in 2013.